The Medieval Program offers work stations or group presentations in a variety of arenas. Each option can be made individually or joined with other options to make a singular program. This period in history offers many opportunities to study wide ranges of human experience. New components and revisions are a constant theme for this offering. Suggestions for additions, revisions, improvements, etc. are always welcome. 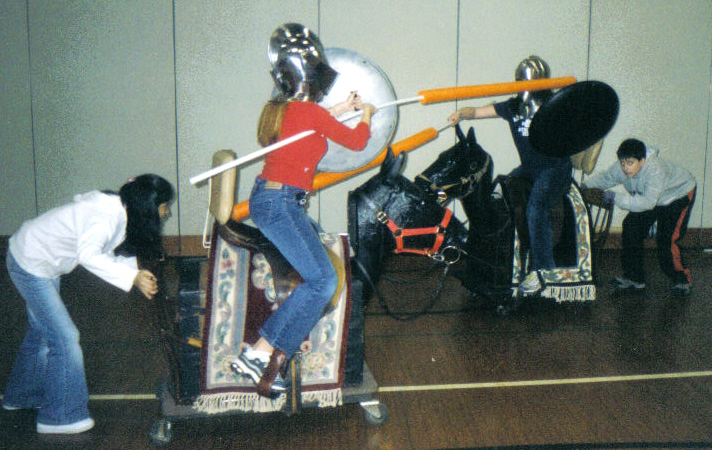 The jousting format presents two rolling horses, each with saddles, on which one student, wearing helmet and shield, is seated with a lance, ready to clash with her or his counter. The second partner provides the motive force by pushing the horse from the rear. The two horses engage along the list line, the knights beat each other silly, then roll down the line to gather another lance. Its, fun, its safe, its hilarious, and they all love it, I promise! Three sets of steel plate armor are displayed, passed from hand to hand and worn by several students during a discussion of armor construction and use. Chain mail is demonstrated in various forms. Several head coifs are passed around and fitted to each student, and two full size jackets are worn by any and all comers. The forger's shop is a mail making station in which students are taught to make crimp mail Using small anvils, tools, and pliable metal wire, the class can make a sizeable piece of mail to be kept at the school. A full scale jousting war horse demonstrates the size and power of the knight's most unique and formidable tool. Powered by an internal mobile cart the fully barded horse and saddle can be ridden down the list line. With a full size metal clad lance in hand any knight can try her/his skill at the quintaine by either knocking a head off a post or capturing the ringed prize. Teachers can ride, but they must get in full armor before getting on the horse. If for some reason a full armor clad teacher cannot find his or her way onto the jousting horse, worry and fear not, for there is another exercise for you. 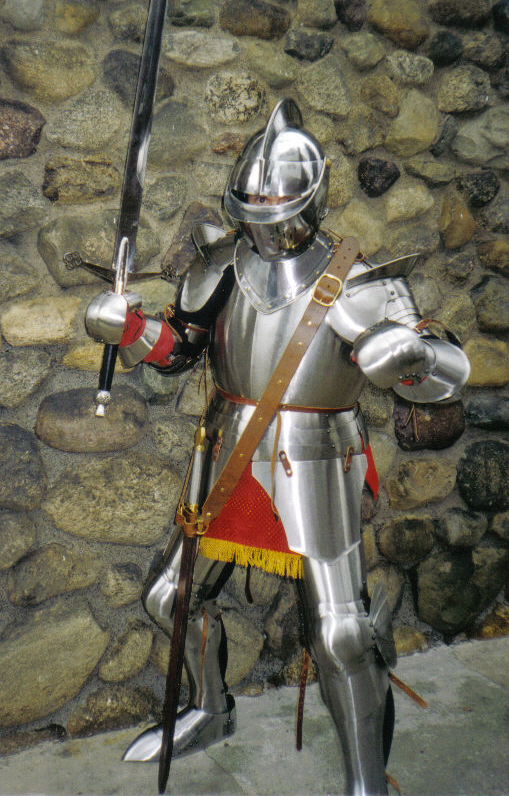 It is the advancing soldier station in which the fully, and I mean FULLY armor clad and protected knight, advances towards the enemy ( students) with sword and shield attempting to slay the adversary. The enemy, (students) are armed with bow and arrows and will attempt to shoot down the advancing threat. Rubber ball tipped and limited in draw power, the winner in this contest is anyone's guess. The stationary advancing soldier station is a more orderly competition of two teams trying to score archery points against four stationary knights in the distance. Rules require only six arrows fired at the four targets and only one minute is permitted. Everyone gets a chance and the winner is determined by team point totals. Medieval Technology incorporated the use of wind power to act as a motive force to drive the powerful mills of western Europe. Four windmill models are offered in this workshop for the students to built and evaluate. A large windmill, using a seven foot step ladder with paddles and sails will lift water and challenge the students to calculate irrigation or drainage capabilities of one or many mills. They will learn about foot acres of water, how much water can weigh, how much it takes to support different crops, and how many machines and work hours are need for various tasks. The Table-Top Grinder Windmill station focuses on building a free standing windmill with internal gears, a grind stone and a water wheel. Complete with paddles the mechanical action is true to life and allows students to appreciate fundamental gearing. How does one feed a family of five or a village of two hundred and fifty souls during the Middle Ages? Using an authentic steel headed, wheeled plough, a team of two farmers, and ten animals will plough several furrows of soil in your gym or in one of your available fields to find the answer to that important question. Lots of numbers in this exercise give an accurate portrayal of how much work was needed to be a successful farmer. Life in the Medieval Village was anything but easy, entertaining, or safe. Seventy five characters, each given out to the students enable them to discover the wide range of personalities, toils, and trial of life in these times. Read aloud in group form, each character and event has deeper meaning and importance to the whole. Discussions, debates, arguments, suits, criticisms, are all part of this very human interactive exercise. Metal gained increasing importance in the lives of Medieval men. How it was made and who made it is the topic for the Metal Makers workshop. It concludes with sword handling and carefully controlled sword play to show what it felt like when two steel swords clanged together.